All of India, and the world at large, is revelling in celebrations of Isha Ambani’s wedding ceremony that is just round the corner. The pre-wedding festivities that kick-started last week saw international icons and eminent dignitaries in attendance. 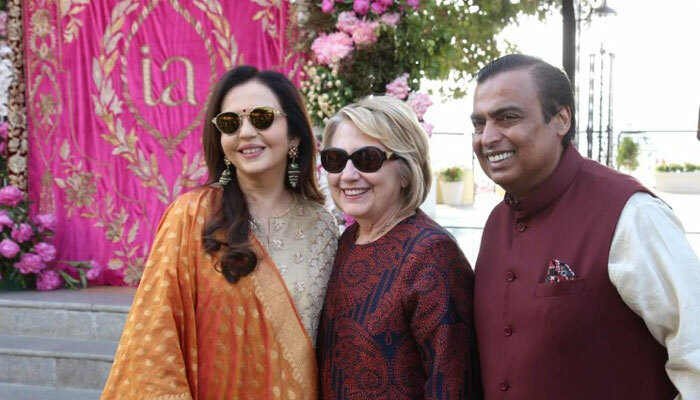 Amongst those who have specially flown to India to mark their presence at India’s biggest wedding of the year is former US First Lady Hillary Clinton and famed singing sensation Beyonce. On Sunday, the Ambanis hosted a grand, magnificent sangeet ceremony in Udaipur, which was attended by the who’s who of Bollywood. The sangeet ceremony entailed a mesmerising performance by Beyonce, but what stole the show was a dance performance by Hillary Clinton. The former US First Lady shook a leg and danced to the beats of Bhangra with John Kerry, former US Secretary Of State and the entire Ambani clan. Hillary was clad in ethnic Indian wear and was seen doing the Punjabi dance with a lot of enthusiasm. Her performance was definitely the highlight of the star-studded night. On the other hand, US singer Beyonce performed at Isha Ambani’s sangeet too. The pop star later released pictures of her desi ensemble, an Abu Jani-Sandeep Khosla creation, that left Queen Bey’s fans jaw-dropped. The legendary singer adorned gold jewels that included a maang patti (forehead band), bracelet and long earrings, with simple, yet classy makeup to perfectly complete the look. Other celebrities who took centre-stage to perform were Shah Rukh Khan, wife Gauri Khan, Aishwarya Rai Bachchan, Salman Khan and Aamir Khan amongst others. The families and their guests left for Mumbai on Sunday night and the wedding will be held at the Ambani residence in Mumbai on December 12. The couple was seen dancing together on stage with him down on his knees and her swinging around him.